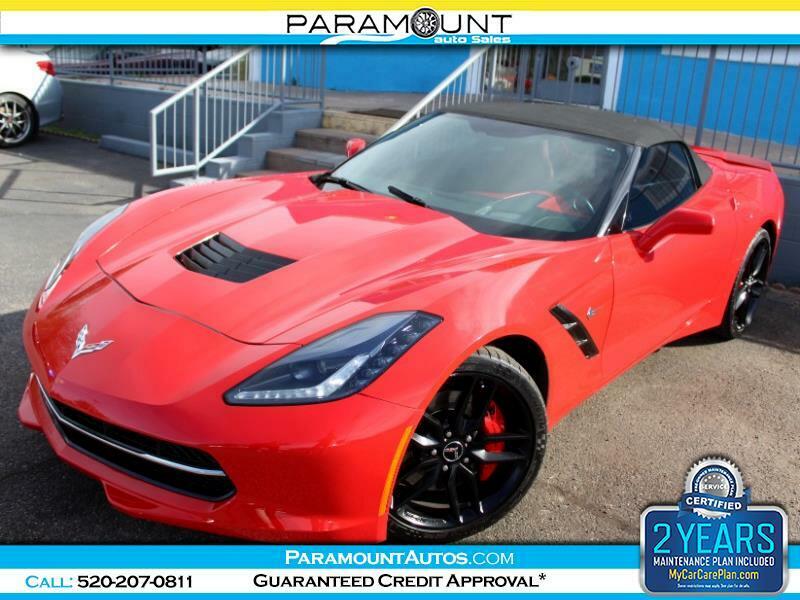 ABSOLUTELY GORGEOUS, 2014 CHEVROLET CORVETTE Z51 3LT CONVERTIBLE WITH ONLY 37K MILES!! THIS STINGRAY IS ALMOST STOCK WITH HE EXCEPTION OF LARGER CAM AND CRP LONG TUBE HEADERS, AND THOSE FEW UPGRADES REALLY WAKE THIS LT1 UP!! THIS IS HOW THIS CAR SHOULD HAVE COME FROM THE FACTORY... LOOKING UNDER THE HOOD THIS CAR LOOKS ALL STOCK, BUT WHEN YOU GET ON THE GAS, YOU WILL NOTICE HOW FREAKISHLY FAST THIS STINGRAY IS! AND IT SOUNDS AMAZING TOO... THIS VETTE STILL HAS THE DUAL MODE NPP FACOTRY EXHAUST AND WHEN ITS PAIRED WITH LONG TUBE HEADERS (ESPECIALLY WHEN ITS CAMMED) LT1s MAKE THE BEST POSSIBLE EXHAUST SOUND! AND THIS VETTE IS FULLY LOADED... IT HAS ALMOST EVERY OPTION YOU CAN GET ON THESE VETTES... MAKES FOR A PERFECT WEEKEND CRUISER / SHOW CAR, AND IF YOU ARE CRAZY ENOUGH, IT WOULD MAKE A GREAT OCCASIONAL TRACK CAR... PRICED LOW TO SELL FAST!! COMES WITH A WARRANTY, CARFAX, AND 2 YEARS OF MAINTENACE... EASY FINANCING AVAILABLE!